One space or two with your full stop? Update, 6 May: the Washington Post has recently weighed in on this decades-long debate. Are you a single-spacer or a doubler? (The post that follows was originally published in August 2011). During the process of editing (or “izing”, as we call it at 21C) a recent press release, we were asked by an impressively detail-oriented client to clean up a certain inconsistency in the document: there was a mixture of single spaces and double spaces after the periods (or full-stops, as some of us know them) at the end of sentences. The client had no particular preference for one space or two, but they rightly wanted a choice to be made – a rule to be followed – to maintain consistency. Who would have thought that the question of this tiny little space – barely wider than a fat ant’s body – would inspire such discussion, disagreement and general excitement amongst my colleagues at 21C? Could it be because our usage of spaces after sentence-ending periods can actually date us? This question of punctuation – and remember, we’re talking about a blank space perhaps 1/32 of an inch or less in width – takes me back to my days as an editor at the BBC, when our world was full of red pens, em-rulers, editing marks and faxed galley proofs. That world changed beyond recognition when we took the gargantuan leap into Desktop Publishing. Instead of facing each other across busy desks of scissors, galleys and glue-sticks (yes, we used glue-sticks), we were suddenly hidden behind screens, grappling with our new vertical work-spaces. No more tapping out texts on typewriters; no more measuring, calculating, snipping and re-measuring; no more faxing proofs back and forth to the printers; and no more phone negotiations and arguments with the printers, haggling over inches and characters, often into the early hours of the morning. As the alien machines landed on our desktops and as our hands, eyes and brains ached from the newness of it all, we found ourselves liberated from the printing process, and our priorities began to shift. No longer did kerning, line-spaces and inches dominate our waking lives, and the new-found ease of manipulating and reshaping our bodies of text freed up our minds to focus more on the linguistic task at hand. The editor and the printer share a common goal: to make the text on the page flow smoothly – linguistically, in the case of the editor, and visually, thanks to the printer. Like any arranged marriage, it’s a relationship fraught with conflicting needs and demands: While we as editors battle to squeeze or stretch our prose into the confines of our prescribed margins and word-counts, printers have the task of deciding when those letters and words are just too close for comfort, when justified text is stretched too thin to allow the word units to pop, or how to avoid those dastardly widows and orphans. And until the advent of computers, it was the printer’s job to emphasize and demarcate the beginning and end of linguistic ‘chunks’ (ie. sentences) by introducing white spaces between them – spaces wider than those that separated the letters. 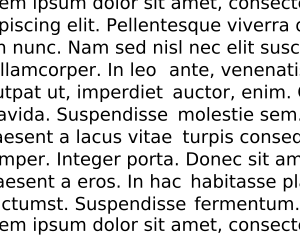 So the double space at the end of the sentence was a visual reading prop, designed to be easier on the eye. But that all changed with the introduction of the computer and the proportional font. Grammar Girl explains below the history of this common shift in usage from two spaces to one, which two of the more influential American style gurus (Chicago Manual and AP Style) have officially adopted and endorsed. It’s all about the difference between mono-spaced and proportional fonts – the former being typewriter-generated and the latter a computer standard. Grammar Girl: How Many Spaces After a Period? Now here’s our first listener question. Yes, the caller is correct and he’s also right that a lot of people haven’t heard about the change. Here’s the deal: Most typewriter fonts are what are called monospaced fonts. That means every character takes up the same amount of space. An “i” takes up as much space as an “m,” for example. When using a monospaced font, where everything is the same width, it makes sense to type two spaces after a period at the end of a sentence to create a visual break. For that reason, people who learned to type on a typewriter were taught to put two spaces after a period at the end of a sentence. 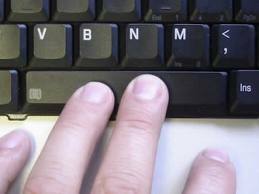 But when you’re typing on a computer, most fonts are proportional fonts, which means that characters are different widths. An “i” is more narrow than an “m,” for example, and putting extra space between sentences doesn’t do anything to improve readability. Notice how in this example, the “i’s” and “t” take up much less space in the proportional font than they do in the monospaced font. Although how many spaces you use is ultimately a style choice, using one space is by far the most widely accepted and logical style. The Chicago Manual of Style (1), the AP Stylebook (2), and the Modern Language Association (3) all recommend using one space after a period at the end of a sentence. Furthermore, page designers have written in begging me to encourage people to use one space because if you send them a document with two spaces after the periods, they have to go in and take all the extra spaces out. I know it’s a hard habit to break if you were trained to use two spaces, but if you can, give one space a try. This entry was posted in Punctuation and tagged full stop, period, spaces, spaces after period on May 6, 2018 by Louise. That’s quite a sharp-eyed client you have. Probably keeps you on your toes in more departments than just punctuation. I was persuaded to make the change from two spaces to one a few months ago after reading a similar article (can’t recall enough details to cite it, I’m afraid) explaining the whole proportional-spacing business. The two-hits-of-the-spacebar habit proved surprisingly easy to break, although it’s something I check before hitting “send” on messages (including this one). But I have great sympathy for people who choose NOT to change. A few years ago, a friend who had submitted her doctoral dissertation had to re-type it for a professor who demanded TWO hits of the spacebar when she had included only one. I can’t recall if it was a keyboard-correctable, computer-printed document or if she actually had to re-type the whole thing, but either way it was an irksome demand.